In 2017 Savwinch introduced the worlds first and only complete 316 Stainless Steel Winch, the SSS range! Like the below SS Winches, these are fully sealed 316 Stainless Steel motors but also feature a full 316 Stainless Steel Gearbox! ​Our SSS Winches are the Rolls Royce of Winches, you cannot find anything better! Our 880 model Winches are available in both our Classic Series and our Signature Series. The Classic Series boat winch has been around for over 10 years now and offer the worlds highest quality Winch at an affordable price. Our Signature Series Winches were introduced in 2016, they are full 316 Stainless Steel motors, they’re completely submersible without the use of sealants or glues, while also offering all the award winning features of the Classic Series. Savwinch were the first to design this smallest drum anchor winch on the market. After doing our own market research, there was a real need for a small winch on the market. So we made one for those with boats up to 5.5 metres. Our 880CS/880SS winch models have been designed to fit into the smallest of anchor wells. The same high quality Savwinch; it comes with all the design features and benefits of the entire Savwinch boat anchor winch range. It also comes with patented electric box and wiring looms as an additional option, making it simple, quick and cost effective to install yourself. Many boating manufacturers are fitting this winch into their boats including Stacers, Quintrex and even Haines Signatures (which due to their small anchor wells couldn’t fit drum winches in previously). They are popular in many alloy and small fiberglass boats. Small but with plenty of grunt, which you have come to expect from Savwinch. So if you thought you could never get a drum winch into your boat due to size limitations, don’t want to have an oversized winch for your application and are looking for a small winch that is strong, durable and cost effective, get your Savwinch today. All of our 880CS/880SS winches come standard with 60m of rope and 6m of chain, though longer specialised lengths can be custom made. Our 1000 model Winches are available in both our Classic Series, our Signature Series and our full 316 Stainless Steel Series. The Classic Series has been around for over 10 years now and offer the worlds highest quality Boat Winch at an affordable price. Our Signature Series Winches were introduced in 2016, they are full 316 Stainless Steel motors, they’re completely submersible without the use of sealants or glues, while also offering all the award winning features of the Classic Series. Our SSS Range features all the great benefits of our SS range, with the addition of a full 316 Stainless Steel Gearbox. Making this the worlds first and only complete 316 Stainless Steel Drum Winch! Boat anchor winch Models 1000CS, 1000SS, and 1000SSS are the second size up in the Savwinch range. Comes with all the standard features and benefits of a Savwinch. This Drum Winch and as with all Sav winches is the quietest of all boat anchor winches comes with a fully sealed motor. All of our 1000CS/1000SS/1000SSS winches come standard with 100m of rope and 7m of chain, though longer specialised lengths can be custom made. Our 1500 model Winches are available in both our Classic Series, our Signature Series, and our full 316 Stainless Steel Series. The Classic Series boat winch has been around for over 10 years now and offer the worlds highest quality Winch at an affordable price. Our Signature Series Winches were introduced in 2016, they are full 316 Stainless Steel motors, they’re completely submersible without the use of sealants or glues, while also offering all the award winning features of the Classic Series. Our SSS Range features all the great benefits of our SS range, with the addition of a full 316 Stainless Steel Gearbox. -Making this the worlds first and only complete 316 Stainless Steel Drum Winch! Model 1500CS, 1500SS and 1500SSS are the third largest electric boat anchor winches in our range. With a robust oversized worm gearbox – to take higher shock loads this winch is powerful and made to last. All of our 1500CS/1500SS/1500SSS winches come standard with 100m of rope and 8m of chain, though longer specialised lengths can be custom made. Our 2000 model Winches are available in both our Classic Series, our Signature Series, and our full 316 Stainless Steel Series. The Classic Series boat winch has been around for over 10 years now and offer the worlds highest quality Winch at an affordable price. Our Signature Series Winches were introduced in 2016, they are full 316 Stainless Steel motors, they’re completely submersible without the use of sealants or glues, while also offering all the award winning features of the Classic Series. Our SSS Range features all the great benefits of our SS range, with the addition of a full 316 Stainless Steel Gearbox. Making this the worlds first and only complete 316 Stainless Steel Drum Winch! The 2000CS, 2000SS and 2000SSS winches are the fourth largest winch in our range. Designed for larger boats up to 10 metres. Popular with many of the commercial fishermen and charter companies, the 2000CS, 2000SS and 2000SSS Savwinch has heaps of grunt and are very reliable. Over engineered to handle harsh applications. Dimensions: 300mm high and 450mm wide (See Dimensional drawing below for more details). All of our 2000CS/2000SS/2000SSS winches come standard with 130m of rope and 10m of chain, though longer specialised lengths can be custom made. Our 3000 model Winches are available in both our Classic Series and our Signature Series. The Classic Series boat winch has been around for over 10 years now and offer the worlds highest quality Winch at an affordable price. Our Signature Series Winches were introduced in 2016, they are full 316 Stainless Steel motors, they’re completely submersible without the use of sealants or glues, while also offering all the award winning features of the Classic Series. The 3000CS and 3000SS Savwinch are the second largest in the Savwinch boat anchor winch range. An absolute monster of a winch it is suitable for up to 14 meter boats. It comes with all the superior design features and benefits of the rest of the Savwinch range. Boasting a 320mm wheel diameter-bearing and bearing hub support it can support over 100metres of rope at 12mm nylon or 150metres of 10mm nylon. The 3000CS and 3000SS Savwinch has heaps of grunt and is very reliable. Over engineered to handle harsh applications. With a robust oversized worm gearbox – to take higher shock loads this winch is powerful and made to last. 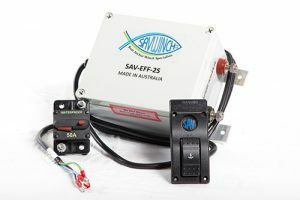 Want your anchor to drop down faster than a standard mechanical up/down, look at our clutch free Savwinch Electronic Fast Fall System, falls as fast as a free fall system but without the problems typical of a clutch system. Ask for the Model SAV EFF 100. 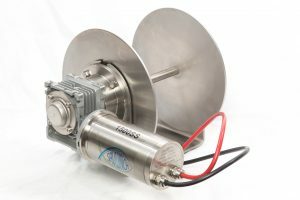 We are proud to have the worlds first electronic Fast Fall system for boat winches, with a patented world winning design. It is mechanical clutch free, which increases the speed of the motor on the way down, comparably as fast as you can freely drop your anchor. Fast Fall system drops the anchor significantly faster than all other fixed speed boat winches. Another advantage of our EFF Electronic Fast Fall Systems is that they can be retrofitted. Our EFF units are simply wired between the battery and the Winch. For simple wiring diagrams, view our digital manual below.